The future of verbal behavior research is integration. Different perspectives and research areas with their respective sets of jargon exist, which could lead one to believe in competing perspectives. However, a close inspection of various areas suggests overlap between those areas. Integrating research from across differing perspectives could result in a comprehensive understanding of verbal behavior. I see comprehensive models of complex verbal behavior in our future. By comprehensive, I simply mean models that explain initial instances of elementary verbal operants up through the complex verbal behavior that adults regularly engage in. We have verbal behavior camps, and individuals within camps have specific foci and respective specific research questions. I observe overlap in the respective work that suggests some integration could produce a better understanding of the controlling variables of complex verbal behavior. In fact, this movement is already upon us. An exemplar is a recent paper by Miguel (2018) on the topic of problem solving. In this paper, Miguel summarized a series of studies and discussed how elementary verbal operants and bidirectional naming (joining of listener and speaker repertoires) explain the capacity to derive various stimulus relations (e.g., auditory-visual, visual-visual). In my opinion, this explanation helps to join two areas of research. The first deals with the development of verbal behavior that gives rise to new behavioral repertoires (e.g., Greer & Ross, 2008; Miguel, 2018). The second deals with derived stimulus relations and the research studying this phenomenon (e.g., Hayes, Barnes-Holmes, & Roche, 2001; Sidman, 1994). This is not the first time researchers have attempted to connect areas of complex behavior (see Wulfert, Dougher, & Greenway, 1991; also see Horne & Lowe, 1996, and the accompanying responses), but the last few decades have been accompanied by copious amounts of data to consider when debating the relative contributions of different areas of research toward explaining complex verbal behavior. Certain behaviors may interfere with the progress of verbal behavior research. From my own interactions with behavior analysis students and behavior analysis colleagues, I believe one issue at hand is the campiness of our jargon within behavior analysis (for a discussion of verbal behavior and stimulus equivalence terminology, see Hall & Chase, 1991). Do we discuss the joining of listener and speaker repertoires, symmetrical auditory-visual relations, or mutually entailed auditory-visual coordinated relations? Well, that depends on one’s learning history, which probably represents the terminology in the textbooks we read in graduate school, the verbal behavior of our mentors, and how our mentors shaped our own verbal repertoire, to name just a few variables. I was raised in the stimulus equivalence camp. I will admit I have not figured out a way to communicate about stimulus equivalence in a manner that is accessible to all behavior analysts. And it has been a slow process for me to determine the overlap between the research findings of stimulus equivalence, relational frame theory (RFT), and verbal behavior—the aggregate of which constitutes a very large literature base, indeed. This has required me to read outside of the literature that I consider to be my own and socialize with individuals who are not from my camp—which has helped me to see the overlap between the camps and determine that there are many complementary aspects of the research and theory proposed by individuals of respective camps. I believe if we put down our jargon and stop pitting our giants (on whose shoulders we all stand) against each other, we could find areas of agreement and build from there. We have more ground to cover to meet the verbal behavior needs of our clients. We have effective, empirically supported interventions to teach initial verbal operants. This research has been very useful to behavior analysts who work in early intensive applied behavior analysis (EI ABA) settings. I increasingly come in contact with behavior analysts who work with older individuals with disabilities—these are the individuals who went through our EI ABA programs and are now teenagers and older. These older individuals have different developmental levels, and the complexity of responses and controlling variables may be different. Behavior analysts who serve these individuals report to me that they have to adapt behavioral interventions from the literature to address the needs of clients and often do so with an “adapt and hope” approach. This is a behavior analysis–wide issue, but given the social nature of many of our older clients’ difficulties, verbal behavior researchers are in a good position to begin researching advanced verbal behavior interventions. I imagine solving problems like this involve both theoretical and empirical verbal behavior work. I hope that The Analysis of Verbal Behavior (TAVB) continues to be a first choice for authors engaging in verbal behavior research. Our journals have evolved to be places where particular narratives and designs have a home, regardless of the specific phenomenon. We have journals for controlled studies that deal with topics of broad interest (Journal of Applied Behavior Analysis), translational evaluations (The Psychological Record), and those dealing with education (Journal of Behavioral Education) and practice (Behavior Analysis in Practice), to name some of our prized journals. Although TAVB is squarely focused on verbal behavior, verbal behavior research is published in TAVB and across our other journals (Petursdottir & Devine, 2017). 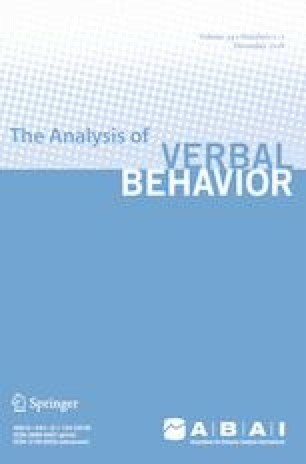 Given the unique importance of verbal behavior in the study of human behavior, it would be advantageous for a larger proportion of the verbal behavior research to be published in one place (TAVB). For me, the question should be, how do we make TAVB the first choice for authors engaging in verbal behavior? Many important empirical and theoretical papers have been published in this journal; however, to fully understand the verbal behavior literature, one has to search through many journals to find relevant studies. One way to promote TAVB as a first choice is to welcome debate and research about complex verbal behavior. Another way to promote the journal is to welcome practitioners (and graduate students) to submit empirical papers describing research conducted out in the real world. By drawing in authors from multiple sectors of behavior analysis, we have the opportunity to continue building the community of verbal behavior researchers. TAVB should play a role in closing the gap between verbal behavior research and frontline practice. My own observation is that frontline practitioners are familiar with the elementary verbal operants, the respective controlling variables, and how to teach specific target responses. I credit this to both the available research and the availability of curricula and assessments that include these verbal operants (Dixon, 2014; Greer & Ross, 2008; Partington, 2006; Sundberg, 2008). Behavior-analytic curricula provide an invaluable dissemination tool to bridge research and practice. TAVB can help extend the reach of verbal behavior interventions by publishing these sorts of tool for the acquisition of advanced verbal behavior repertoires. This information can be communicated in a few manners. First, advanced verbal behavior interventions that have garnered considerable empirical support could be published as tutorials for practitioners (i.e., “how-to” manuals). Second, a number of papers could be published that attempt to tie together various areas of verbal behavior research that will aid a practitioner in his or her independent reading of the larger body of verbal behavior literature (e.g., connecting bidirectional naming with derived relations). Third, the journal should publish research evaluating new interventions that target advanced verbal behavior repertoires. There are a number of areas of research that overlap under the umbrella of verbal behavior research. My own history governs how I view the ways different areas of verbal behavior research map onto each other. My graduate research dealt with equivalence class formation, or the formation of classes among physically disparate stimuli. From this perspective, it was relatively easy to see how RFT mapped onto the work of Sidman by discussing different relational control between stimuli in relational networks (akin to the literature on contextual control of equivalence relations that was published at the time; e.g., see Bush, Sidman, & de Rose, 1989). That all stimuli were not equivalent (substitutable) meant that the terms symmetry and transitivity needed to be replaced with mutual and combinatorial entailment to accommodate the different types of relational control (according to Hayes et al., 2001). Later in my career, I discovered where traditional verbal behavior research intersected with equivalence classes and relational frames. The concept of bidirectional naming, or the joining of listener and speaker repertoires, is a Skinnerean account of what stimulus equivalence and RFT researchers would tact as derived relations (symmetrical auditory-visual relations or mutually entailed auditory-visual relations). Much of the verbal behavior research (but certainly not all; see Petursdottir & Devine, 2017) deals with the acquisition of verbal operants and verbal repertoires up to the point of bidirectional naming, thus connecting that long lineage of verbal behavior empirical work to that of researchers investigating derived relations. Although many disagreements remain between these various perspectives, if one looks for commonalities, one will discover that there are agreements, too. For example, Hayes et al. (2001) suggested that a history of multiple-exemplar instruction is likely the source of relational frames, and multiple-exemplar instruction has been found to be a robust intervention to induce bidirectional naming (Greer & Longano, 2010). Graduate programs can assist in promoting a call to action for verbal behavior research. Since entering academia, I have always taught classes that include an applied research project as part of the course requirements. The majority of my students’ studies have been in the area of verbal behavior because the participants my students work with have verbal behavior learning goals. Many of my students conducted direct replications or minor extensions of the existing literature. Other students had to make modifications to interventions to adapt them to the specific participants and contexts. I have observed the collection of a lot of data sets, but too often there was not an outlet for that work. Thankfully, journals have recently included submission categories that are well suited to the dissemination of such data sets. For example, Behavior Analysis in Practice has a Brief Practice category (see also the Journal of Applied Behavior Analysis Replication category). The Brief Report category at TAVB could be adapted to meet a similar function. This would allow faculty in universities to get students involved in disseminating and replicating verbal behavior research with the only additional effort being that involved in editing class papers to be appropriate for submission to TAVB for peer review. This would be an easy way for faculty in universities to get students involved in promoting verbal behavior research. For those interested in verbal behavior research, know that there is a lot we have yet to understand—which makes this area of research interesting. Ask a question and then conduct research to answer the question. I encourage the next generation of researchers to be curious and also to be skeptical of what we claim to have already figured out. Philosophical doubt is an important attitude of science that “requires the scientist to continually question the truthfulness of what is regarded as fact” (Cooper, Heron, & Heward, 2007, p. 6). There are interactions between different areas of research that have yet to be addressed. For example, much of the stimulus equivalence literature has been conducted with adults, and researchers have identified different training parameters that affect whether an individual derives equivalence classes. Given that the modal participant in a stimulus equivalence study is a college student, we presume those participants to have the bidirectional naming cusp. For now, let us assume that bidirectional naming is the repertoire that gives rise to the capacity to derive relations. If bidirectional naming gives rise to the capacity to derive relations, then why does interspersing the training of baseline relations with derived-relations probes (simple-to-complex protocol) produce more participants who form equivalence classes than having a protocol that trains all baseline relations simultaneously followed by a single block that tests the emergence of all derived relations (simultaneous protocol; see Fienup, Wright, & Fields, 2015)? To connect this to verbal operants and verbal repertoires, one has to consider how the temporal arrangement of baseline relations and tests for derived relations affects one’s verbal behavior. And despite the inferiority of the simultaneous protocol, why does this protocol produce substantially better outcomes when one learns classes of academically relevant stimuli (e.g., neuroanatomy stimuli) compared to when one learns relations between abstract stimuli (e.g., Adams, Fields, & Verhave, 1993)? Verbal behavior such as naming may play a role in why an individual readily forms classes among stimuli one can tact (academically relevant) versus abstract stimuli; however, some basic studies include nonsense-syllable stimuli that a participant could certainly respond to textually and yet most participants still fail to form equivalence classes. The stimulus equivalence literature is ripe with examples of variables that influence whether an individual will form equivalence classes, and integrating different perspectives, with their different foci, has the potential to lead to a better understanding of the controlling variables of complex behavior. I hope that the pages of TAVB can be a place for continued debate about the controlling variables of complex verbal behavior and supporting empirical work. Regardless of one’s orientation, we all share a common goal of understanding this phenomenon. Each of us should be open to revising his or her views based on new data because we are a science of knowing through experimentation, not a science of knowing through authority. The process of integration of findings starts with understanding the respective orientations, studying the empirical evidence for different approaches, and determining the overlap between approaches (despite terminology differences). I imagine that prominent approaches will not experience a wholesale win or loss in this debate. Rather, something better will come out the other side that is of benefit to our understanding of complex verbal behavior—our shared terminal goal. This article does not contain any studies with human participants performed by any of the authors. Thus, informed consent was not relevant to this manuscript.